Twitch gamer Mike ‘qik1’ Iarossi was livestreaming when, having suffered from an unknown illness for days, he suddenly became too sick to go on. He told those watching his stream that, because he has no health insurance, he was planning to stick it out with his symptoms for a week, until he could see a doctor at his local free clinic in Akron, Ohio. But his viewers — some of whom had been watching Iarossi, a former Nintendo world champion, for years — weren’t willing to take that chance. At the hospital, Iarossi discovered he was seriously ill. On top of high blood sugar (he is diabetic), Iarossi had a kidney infection, a staph infection in his blood, and pneumonia. The pain that had forced him to stop streaming was from a stomach ballooned with built-up gas. Iarossi ended up staying in the hospital for a week. 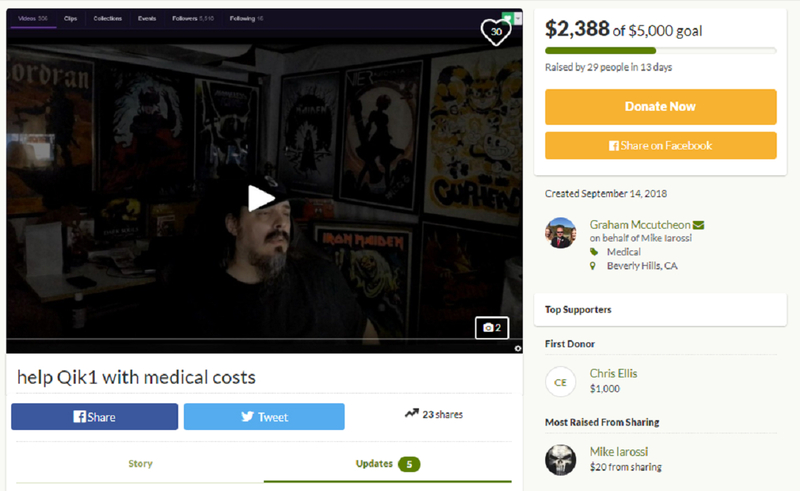 In the most recent update on his GoFundMe, posted today, he writes that he’s nearly finished with intravenous antibiotics and will be starting at-home medication to help clear up the last of his infections. Thus far, the GoFundMe has raised $2,388 of its $5,000 goal.